Which is it? 1995? Or 1994? As I detailed in my 8/16 blog piece here, there are problems with the way Ross Gelbspan describes what prompted him to look into the funding of skeptic climate scientists. But there is no ambiguity about when he says that particular event happened. It all took place after the publication of a March 19, 1995 article he co-authored. One interviewer said Gelbspan’s eye-opening experience began just a few days afterward. (full text here). But we also have two big contradictions about that date. Among the speakers at the conference in Florida was a face new to me. Ross Gelbspan, a Pulitzer Prize winning journalist who had worked for the Boston Globe and the Washington Post, had been researching the carbon club’s dissidents for more than three years. He had written a book on them, and it was soon to be published. Do the math. From April ’97 to April ’96 is one year. April ’96 to April ’95 is two years. April ’95 to April ’94 is three years. Go ‘more than’ that, and you can end up in late 1993. But then we have another contradiction, from Gelbspan himself, barely 27 seconds into his own video which dates from at least late 2009 if not earlier. 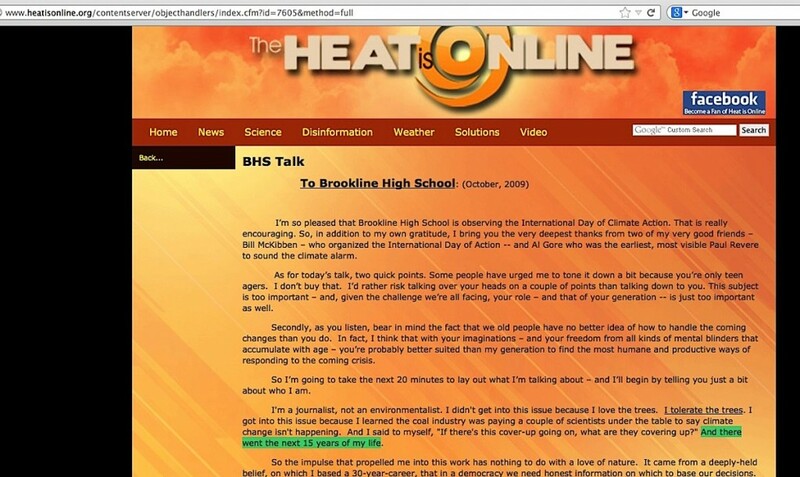 And as it turns out, what he says throughout that video basically matches word-for-word to what he said in his October 2009 speech to a high school assembly (full context here). I’m a journalist, not an environmentalist. I didn’t get into this issue because I love the trees. I tolerate the trees. I got into this issue because I learned the coal industry was paying a couple of scientists under the table to say climate change isn’t happening. And I said to myself, “If there’s this cover-up going on, what are they covering up?” And there went the next 15 years of my life. Do the math. From October ’09 to October ’08 is one year. Carry that back fourteen more times and you arrive at October 1994. Using Gelbspan’s own narratives about his discovery of the “corruption” of skeptic climate scientists happening right around late March 1995, he should have told the school audience “there went the next 14 and a half years“. Was Gelbspan just rounding-up the time length to a whole number, and is Jeremy Leggett’s otherwise vivid memory simply murky on this matter? 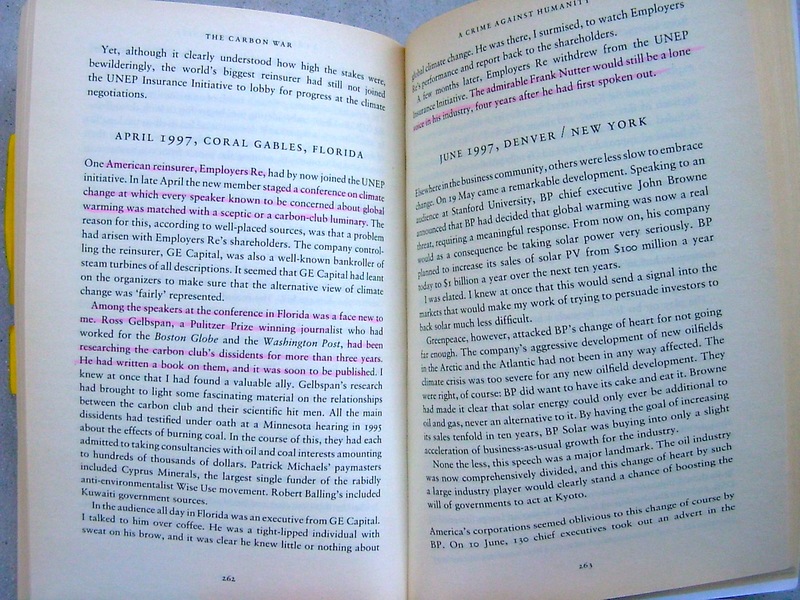 Or are these inadvertent hints pointing to a major problem in Gelbspan’s timeline? 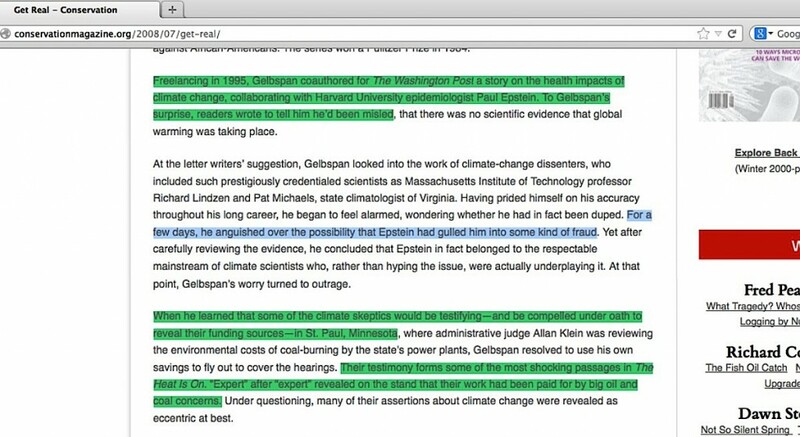 In future blogs here, I’ll have to detail two other separate situations that prompt more questions about whether Gelbspan actually began looking into the motives and funding of skeptic climate scientists in 1994, or perhaps even in 1993. This entry was posted in Discovery odyssey, Irreconcilable differences, Timeline inconsistencies and tagged Jeremy Leggett, Paul R. Epstein by Russell Cook. Bookmark the permalink.